Look back into Peru's rich past to cultures that predated the Incas by centuries and left a remarkable legacy on the Peruvian landscape! Ascend into the Andean highlands to see the Inca heritage of Cuzco and Machu Picchu. You can extend your trip with optional excursions to Lake Titicaca and Bolivia, where you see the massive ruins of an ancient civilization that predates the Inca, Tiahuanacu. Explore La Paz, cradled at the foot of snow-capped Mt. Illimani. In Peru, you can venture north into the desert areas around Trujillo and Chiclayo to see the newly discovered tomb of the Lord of Sipan or venture south of Lima to the mysterious lines and drawings of the Plains of Nazca. 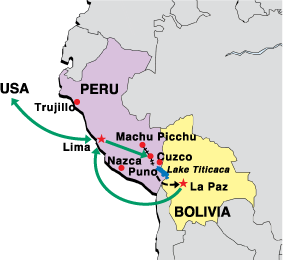 Upgrade to Hiram Bingham Train from Machu Picchu to Cuzco (Does not operate on Sunday). 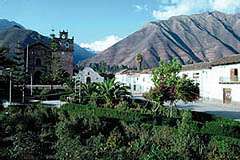 Includes additional for transfer of excess luggage to Cuzco and a private transfer from the Poroy Train Station to Cuzco.